After months of being cooped up, we know you’re dying to take in some sun during the warm summer months. It’s time to uncover the pool, dust off your patio furniture and invite friends and family over for a pool party or cookout. But what’s a celebration without the right music? We make it easy for you to play your favorite albums and playlists by extending your home audio systemoutdoors. 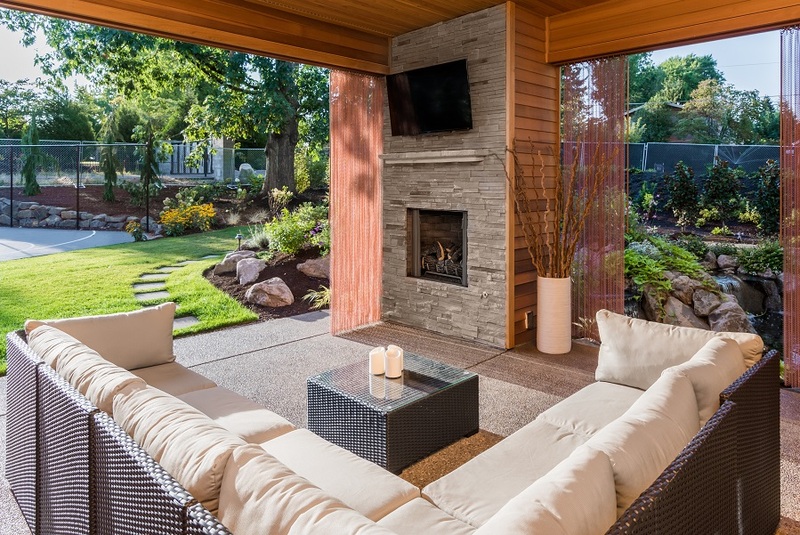 Check out how you can create unforgettable outdoor entertainment spaces in your home. What Speakers Should I Use? Many people, unaware of the great options available to them, use stereos connected to the nearest outlet or inconsistent wireless Bluetooth speakers. There’s no need to settle for these makeshift solutions when you can install a comprehensive one sure to provide balanced, quality audio throughout your entire space. We recommend going with Origin Acoustics’ Outdoor Seasons Collection. This line is built with sturdy material to brave the elements and innovative technology to provide high-fidelity audio. Depending on your priorities, we help you find the speakers that suit you best. For example, some are better at producing deep bass sounds while others, like the Landscape Series, are better at blending in with your foliage. Where Should I Install My Speakers? There are a few things to take into account when designing a speaker layout. How big an area will you cover? Will you want to divide your system into distinct zones to play different music on your patio and pool simultaneously? We create a thorough wiring installation to install speakers exactly where they’re needed. We also find a balance between coverage and volume, so you don’t end up with a speaker every two feet just to get even sound. As a general rule of thumb, all your speakers should face towards your house. This will help boost your sound—since the sound waves hit the wall and bounce back towards you—and keep you from annoying neighbors along the way. How Will I Get Access to My Music? We connect your outdoor speakers to your home audio system to make it easy for you to access your favorite music. With a control solution from Savant Systems, you can stream music, access your media library or even use your turntable. We keep your electronics safely hidden away inside in an AV closet then use matrix switchers to relay the signal to your equipment outside. With Savant, you can pull up the song, album or playlist you want and where you want to play it at the press of a button. Depending on how you’d like to use your system, we can give you control from your smartphone, a dedicated touchpad or remote. Make this summer unforgettable with an outdoor music system that will impress friends and family in your home in West Fargo and the surrounding metropolitan area. Contact Custom Cinema and Sound to set up a consultation.